This renowned psychiatrist founded the school of analytical psychology and described extroverted and introverted personality types as well as the collective unconscious. He also tried to explain what causes happiness and reached a conclusion that it has nothing to do with wealth. With the help of these profound words, the scholar wanted to underline the importance of mental well-being when it comes to personal happiness. Jung was convinced that people can and should control their mental state as well as their attitude to what is going on with certain mental practices. People are social creatures and usually tend to spend time with other people, so it’s paramount to realize that a bad relationship is as deteriorating as being a loner actually. Thus, Jung stated that every social connection matters, be it a relationship with a family member, a spouse, a friend, a colleague, a neighbor, or a stranger on the street. By this quote, Jung meant to say that we shouldn’t underestimate the importance of being thankful for all we have and present in this very moment. However riddled our life seems to be, there’s always the light at the end of the tunnel and there’s always something to be grateful for. It partially coincides with the previous element of life and happiness. That’s certainly true that living a happy life is not a bed of roses sometimes since we have many obligations like work for example. In spite of this, we must always remember that being productive and having a lucrative job doesn’t necessarily translate into being happy. Live to work and work to live are two completely different concepts. This quote doesn’t mean that people must be extremely pious and attend the church services every day or learn the holy book by heart. A strong belief in something bigger, something totally inexplicable, however, certainly adds more meaning to our life which equals to personal happiness. It gives hope that the life after death exists and that whatever you’ve done you still have a chance to redeem your sins. Hope in its turn gives the life purpose and that’s why it is often regarded as an essential element of a good life too. 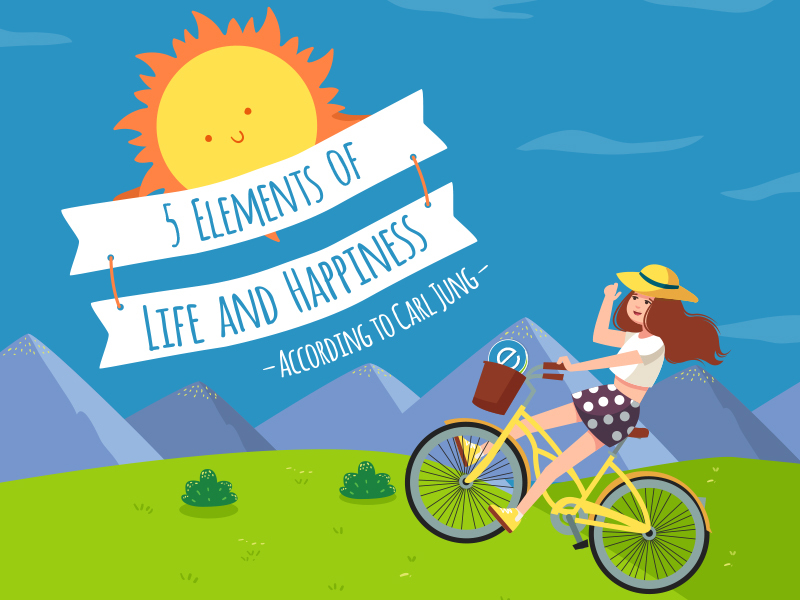 These 5 major factors of life and happiness appear to be quite straightforward and understandable, but to avoid possible misunderstandings Carl Jung also pointed out that under some circumstances all these elements may create a totally opposite effect and make a person feel miserable. What is more, this psychiatrist mentioned that if a person deliberately attempts to pursue happiness, he or she is almost sure to fail. In conclusion, Carl Jung has done a good job in determining the crucial factors of a good life and happiness. Caring about mental health, building better relationships, being alert and appreciative, enjoying the good life and work standards, and retaining hope and belief definitely contribute to the personal happiness. Do you share Jung’s opinion on the essential elements? Or do you have your own key to personal happiness?